Eagle Scout project makes local history. Travis Ballard, 14, poses with the replica outhouse he built next to the Mitchell Adobe at Heritage Junction, as an Eagle Scout project. 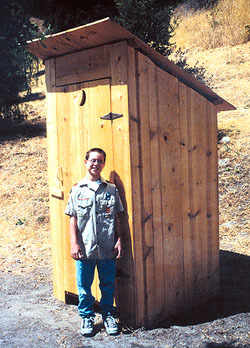 s part of the requirements toward becoming an Eagle Scout, 14-year-old Travis Ballard of Saugus started a project to build an outhouse  and not just any outhouse. Ballard built one that would make history, or at least be a part of it. Ballard's project was to build an outhouse for the Santa Clarita Valley Historical Society, to go next to the Mitchell Adobe Schoolhouse at Heritage Junction. "The school house had no bathroom," said Sue Yurosek, restoration chair for the historical society. "It would have had an outhouse at some time. We have a lot of children tour the park, and some of them have never seen an outhouse before. "When Travis called looking for his Eagle Scout project I jokingly suggested he build us an outhouse," Yurosek said. "He got very interested and his whole troop got very interested." Ballard said he liked the idea of building something more permanent. "I like it because it's going to stay there a while, like when I have kids or when I'm older. I could show it to people down the road," he said. "I'm proud of it. But I'm glad it's done." Ballard began the project Jan 31. The outhouse, built on Ballard's driveway, was moved to the site last week, he said. "It took me awhile," he said. "Terry Lumber was the only place that donated wood, donated everything I asked for. The Andy Gump company donated $200 to get the wood to finish it." Ballard's mom, Sherrie, said without the help of those two companies, the outhouse would not have been built. "We really did call six to eight lumber places," she said. "Terry Lumber is the only one who donated anything and Andy Gump was more than generous with their $200 donation." After getting all the supplies, the outhouse was built over 20 hours from June 9 to June 19. Family members, neighbors and friends helped out, including Travis' father Ray, grandfather Frank, uncles Dennis and Mike Ballard, neighbors Stanley Rolden and Bill Elliott, and church members. The outhouse design was based on an old-fashioned design used in the early 1900s, from a book Yurosek lent to Travis. The outhouse is made from pine and features authentic antique hinges, Ballard said. "I got the hinges from my great-grandfather," Ballard said. "He lives in Utah. He found an old barn and took the hinges off it and then sent them in the mail." Moving the non-functional outhouse to the site was another ordeal. "There were really two groups that helped in this project," Sherrie Ballard said. "Travis' dad and uncles and neighbors helped build it, but the troop, Troopmaster Kirk Baker and all the troop's dad's moved it." With the help from Scout Troop 581, the outhouse was moved into position Saturday.